Moorhead and Benson isn't an accountancy firm, as the moniker might suggest. Together, the writing/directing/acting duo of Aaron Moorhead and Justin Benson have formed one of the most fascinating filmmaking forces to emerge over the last decade. The pair gained much acclaim for their second film, 2014's Spring. A Lovecraft meets Linklater hybrid in which a young American falls for a mysterious Italian girl who is secretly a tentacled creature feeding off tourists, it's one of the most romantic movies to ever come out of the horror genre. In the films of Moorhead and Benson, humans struggling with earthly problems - grief, poverty, addiction - find there are forces greater than us at play in our world. 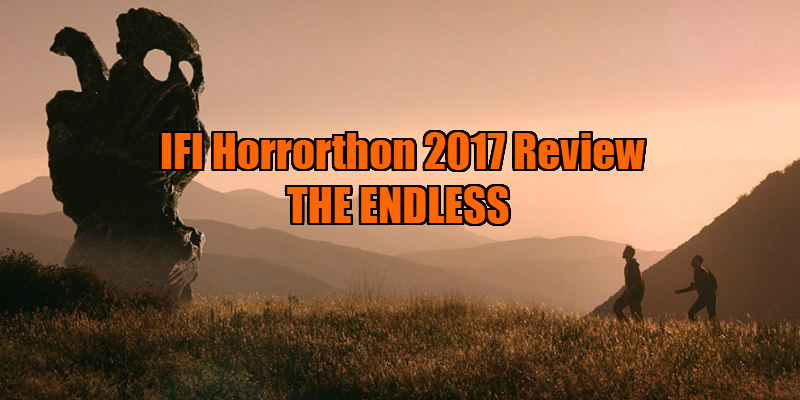 The duo's third film, The Endless, is a sequel to their 2012 debut Resolution. That movie tells the story of Mike (Peter Cilella), who receives a strange and worrying video that suggests his troubled junkie friend Chris (Vinny Curran) is on the verge of committing suicide. Mike tracks Chris down to a remote cabin, handcuffing his friend to the wall to force him into cold turkey. When Mike and Chris begin receiving inexplicable messages through various media forms, ranging from vinyl records to VHS tapes, they discover a strange unearthly force is at play in the surrounding area. A seemingly throwaway scene in Resolution saw Mike stumble upon a group of men, members of a cult based in the locality. The Endless follows up on this moment, with two of the cult members - played by Moorhead and Benson using their own first names - living humdrum lives 10 years after fleeing the cult. As with Resolution, a video arrives in the post that seems to suggest the cult members are about to pull a Jonestown style mass suicide, and after much badgering, the younger Aaron encourages his weary older brother Justin to accompany him back to the commune they grew up in. On arrival, the cult seems like a typical commune setup, populated by people who probably couldn't function in normal life, but it soon becomes apparent a supernatural power is present in the surrounding area. This manifests itself in increasingly spooky and surreal ways, from two moons appearing in the sky, to characters finding themselves caught in time loops they can't escape from. Unable to leave the commune as a result, Aaron and Justin struggle to find a solution to their predicament before the much prophesied appearance of a third moon destroys the world they've become trapped in. In both Resolution and The Endless, Benson and Moorhead draw from various sources. A lazy comparison would be David Lynch, particularly Lost Highway and Mulholland Drive, but perhaps the most explicit influence is Alain Resnais' surreal classic Last Year at Marienbad, which set the template for head-melting dramas in which characters become trapped between indefinable temporal and spatial boundaries. Both films also play like a very American riff on the very British folk-horror genre that was popular in the '70s. The cult aspect of The Endless makes it impossible not to think of The Wicker Man, but thematically, with its exploration of astrophysics, time loops and a supernatural force in the land itself, it appears to owe a heavy debt to the cult kids' show Children of the Stones. 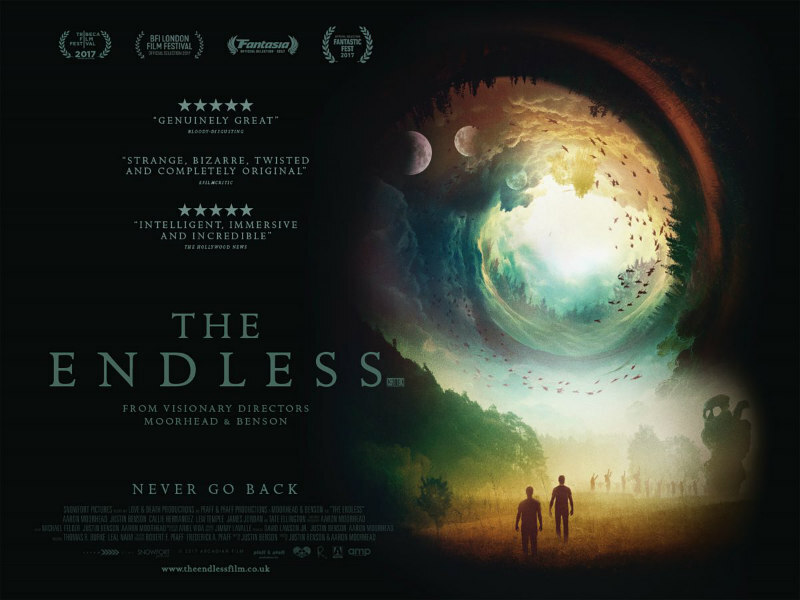 The marketing for The Endless has been coy about its relationship to Resolution (understandable, given how few people saw Moorhead and Benson's debut), but I can't stress loudly enough how you need to have seen the earlier film for this sequel to have its intended impact. Along with a wonderful reappearance by the protagonists of Resolution, The Endless features many little nods that will make no sense to viewers coming in cold. With the nature of time playing such a large role in this nascent possible series, it would make perfect sense for Moorhead and Benson to return at set intervals, like a surreal riff on Linklater's Before... films. The Endless is that rare sequel that doesn't just best its predecessor, but adds more layers to it. If this does grow into an ongoing series, I'm fully onboard. The Endless is in UK cinemas June 29th.